Is there a curation crisis? The more than a hundred or so years of full-scale archeology in the U.S. has created an enormous stockpile of valuable collections that require ongoing attention. This accumulation of collections grew geometrically beginning in the '70s, when new laws were enacted that required archeological work in specific circumstances and the curation of the resulting collections (see Section III). For example, the Arizona State Museum at the University of Arizona curated about 950 standardized archival boxes of federally-owned archeological materials in 1969-70. Twenty years later it had 8,624 boxes, which doubled again by 1999-2000 (Thompson 2000). When we say, though, that there is a "crisis" related to the management and care of these collections, what exactly do we mean? Crowded, unprotected objects in storage. Photo courtesy of the Art Conservation Center @ Univ. of Denver (formerly RMCC), Denver, CO.
Up to and since the issuance of 36 CFR 79 in 1990, most archeological collections were cared for inadequately on a long-term basis. The U.S. Army Corps of Engineers estimates that it spent approximately $165 million on archeological projects between 1975-90 while spending virtually nothing on curation of the resulting material remains and associated records (Trimble and Meyers 1991). Archeological collections were housed in repositories with inadequate space, a problem usually compounded with insufficient funding and a lack of professionally trained personnel. 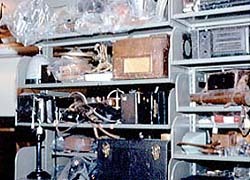 Some repositories could not accept any more collections due to lack of space and staff. Several studies were undertaken from the late '70s through today to try to understand and quantify the problems. A study done by the American Anthropological Association (AAA) in 1979 reported a wide range of problems and inconsistencies among repositories. Problems included: inadequate facilities, poor storage practices, collection deterioration, loss of entire collections, inaccessibility to collections, insufficient catalogs and inventories, and lack of security (Lindsay et. al 1979). A 1986 Government Accounting Office (GAO) report, "Cultural Resources--Problems Protecting and Preserving Federal Archaeological Resources", also highlighted problems in repositories, specifically those with federal collections. Their report found that 24% of the respondents had no inventory of their archeological collections, 30% had never inspected the condition of their collections, and 30% of non-federal repositories had already run out of room. Federal agencies also often had no idea what they owned or where it was stored. Despite some real progress in recent years, today, a number of federal agencies still do not know what they own or are responsible for. One the other hand, agencies such as the National Park Service have a clear idea of what they need to do and the enormous costs involved. In 1992, the NPS estimated they had 24.6 million archeological artifacts, 16.8 million of which still needed cataloging at a cost of $46.9 million dollars. The agency also estimated that $59.8 million was needed to rectify physical plant deficiencies and $158 million to construct new facilities (Hitchcock 1994). Some of these estimates changed after Congress allotted some funding to speed up the cataloging backlog. Clearly, there has been a crisis in archeological collections management and care. Has enough progress been made in the last few years to say that the crisis is over? We can say that considerable strides have been made to rectify some of these problems. New federal facilities, such as the Anasazi Heritage Center of the BLM and the Museum Resource Center of the NPS, have been built to comply with the basic standards set forth in 36 CFR 79. There are efforts underway to build repositories on tribal lands to care for both federal and tribal collections. Money finally is being allocated to correct some of the storage and staffing problems at federal repositories. The U.S. Army Corps of Engineers founded the Mandatory Center of Expertise for the Curation and Management of Archaeological Collections (MCX-CMAC) to provide guidance and expertise on collections assessment and rehabilitation standards for the Department of Defense and others. Many other federal agencies have been working diligently (often with non-federal repositories) to comply with 36 CFR 79. Also, NAGPRA has pushed many federal agencies to inventory their collections in order to determine if they own materials that are affected by this law. Many laws and policies concerning archeological collections management have been enacted at the state and local levels (see Section III). This means that not only are the State Historic Preservation Office staff and the State Archeologist paying more attention to the issues, but also the staff of the Department of Transportation and similar agencies with active archeological programs. As well, some states, such as Maryland and Rhode Island, have built new repositories meeting the standards set forth in 36 CFR 79, while others are upgrading their facilities. As federal, state, and local agencies become more aware of their responsibilities to their collections, the contractors who conduct the compliance work are hiring and/or training staff to better handle collections preparation and to work with the repositories that will care for the collections over the long term. Since some contract work is performed by university-based groups, some are learning the necessary skills to handle the collections, although generally not through formal coursework. In general, the university setting is where archeological collections may be at the greatest risk of inadequate management and long-term care. Realistically, despite the progress, the crisis is not over. Major problems and issues still exist, many of which are discussed in other sections. Some of the largest problems exist for non-federal and non-state collections, collections for which 36 CFR 79 does not apply. The important thing to remember, though, is that there is momentum to work on the better care and management of archeological collections. Archeologists and museum professionals, including archivists and conservators, need to work together to maintain that momentum.